A few years ago, for some reason, I got slightly obsessed with Bill Cosby. America’s number one funnyman and TV dad has to be one of the most recognizable figures on the planet, and while he occasionally says something controversial once in a while, for the most part, he’s beloved the world over. Also, doing impressions of him is one of our nation’s favorite pastimes. Zippy zop zop doo bee bop Jello-O pudding. Cosby’s career spans for decades, and the number of different roles he’s played over the years is seconded only by the number of different sweaters he must own. Depending on when you grew up, Bill Cosby was either a secret agent on I Spy, a wildly successful stand-up comedian, Dr. Cliff Huxtable on The Cosby Show, or a ubiquitous pitchman for Jell-O, Kodak, Coca-Cola, Texas Instruments, or any one of a number of companies that paid to have Cosby as their spokesman. But there’s a lesser known part of Bill Cosby’s career that has developed a rather passionate fan base (and no, I’m not talking about Leonard: Part 6…how dare you even think that). 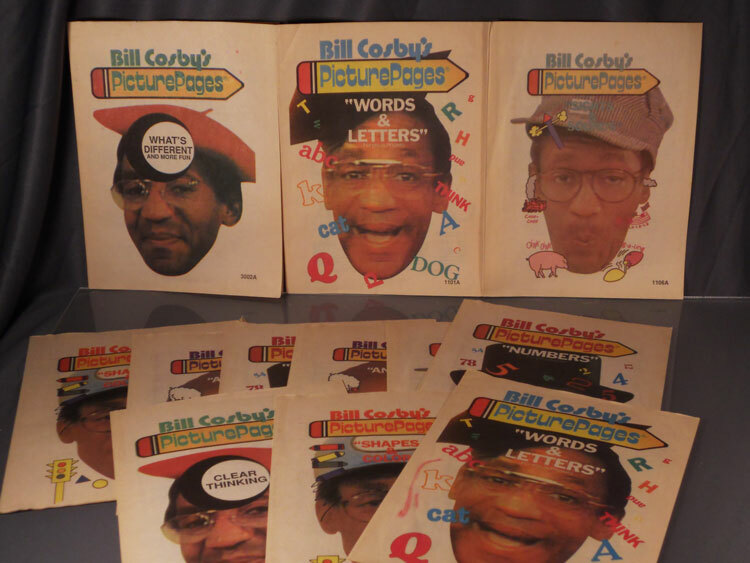 In the early 1980s, Cosby took over the hosting duties of a program called Picture Pages. The program began as a children’s television show on a local Pittsburgh affiliate before being assimilated into the Captain Kangaroo program. The show was based on the idea that children would have workbooks with images that matched what was being shown on the screen, and the host would walk the children through these segments to teach them simple lessons about the differences between inside and outside, shapes and sizes, colors, animals, and a bunch of other lessons aimed at a very, very young and impressionable audience. During Cosby’s time as host, Picture Pages was shown in the very, very early days of Nickelodeon on Pinwheel, which ran until 1989. Nickelodeon also used short segments from the show as filler in between their programs, and so segments of Bill Cosby’s Picture Pages were being shown into the early 1990s. In other words, there is at least an entire decade where Picture Pages was shown on Nickelodeon for a nationwide audience, and it coincided perfectly with Cosby’s tenure on his self-titled NBC sitcom, despite the fact that they were not being taped simultaneously. As an adult, looking back on Bill Cosby’s Picture Pages has been rather interesting. Obviously, the show was done on the cheap side. Cosby has made it clear time and time again that believes in the importance of educating the youth of America, but in this show, rather than go about it with the kind of unbridled enthusiasm seen in most children’s programming, Cosby appears sleepy and possibly drunk most of the time, slurring his way through dialogue with the excitement of watching bananas rot. 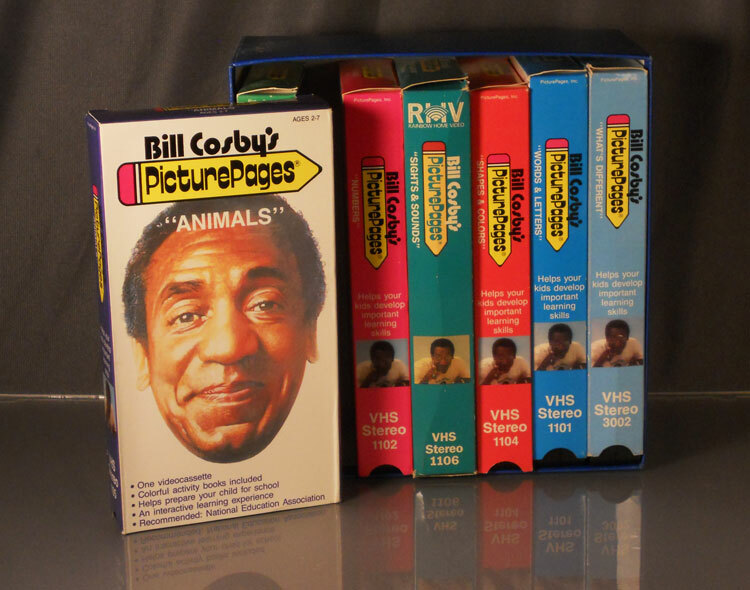 If you caught episodes in their entirety, he would do improvised transitions, most of which seemed to result in Cosby getting progressively more annoyed at an unseen gaggle of children imploring him to provide them with more Picture Pages. Also, I know it’s a show aimed at children, but you have to question the educational value of drawing lines from one thing to another. It’s the kind of mindless busy work given to nursery school and kindergarten students while the teacher grabs a smoke or quick glances at the latest issue of Cosmopolitan magazine, not something that can be broadcast on national television for 22 minutes at a time. I think a combination of vague but positive childhood memories of Picture Pages coupled with nostalgia buffs like myself who look for subversive, unintentionally hilarious vintage programming are responsible for a cult-like following of Picture Pages today. When you mention it to someone between the ages of 25 and 40, either you’re met with a look of utter confusion and no concept of what the show is like or a juiced up enthusiasm from someone who truly understands the nature of Picture Pages. Now, not surprisingly, there is not a whole lot to collect if you want to start a Picture Pages collection. I discovered the program by stumbling upon VHS tapes at various thrift stores in the area, and you shouldn’t plan on paying more than a couple of bucks at most for each one. If you’re lucky, you might find one of the workbooks tucked in with the VHS tape. This is crucial if you’re hoping to follow to follow along with the program, especially when Cosby asks you to flip to page J-5 or something like that. The show works without the workbook and essentially because participatory in the same way something like Sesame Street or Blue’s Clues does, but Cosby references the book and the use of a writing utensil just enough to seem confusing to anyone that doesn’t realize a workbook is required. 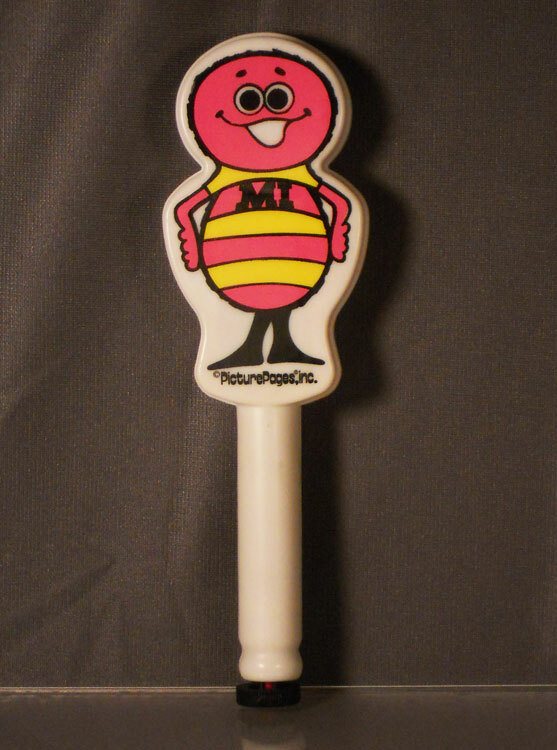 However, one piece of merchandise in particular is very, desirable, and that’s a fun little character named Mortimer Ichabod Marker. Mortimer Ichabod (or MI for short) is an anthropomorphic bee or insect-like creature that acts as a gatekeeper between universes: our own world, and that of Bill Cosby’s Picture Pages. While crayons and pencils will serve just fine for drawing lines from object to object, MI was blessed with special powers. Specifically, he was able to make what has been described as a “doodly doo” sound, an ascending or descending scale of beeps and boops as the line was drawn. To children of the 1980s and early 1990s, this sound was like the voice of an angel, soothing, familiar, gentle. A company called Kusan was called upon to recreate Picture Pages’ closest thing to a mascot. In doing so, they created an object that is highly prized among collectors of everything 1980s. This is the official Mortimer Ichabod Marker. If it seems big an unwieldy, that’s because sometimes, you have to make certain sacrifices to get things perfect, especially if it was the early 1980s and electronics were involved. MI takes one 9-volt battery, and then you insert your own pen, pencil, marker, or crayon into the tip. Press it down to a piece of paper, and the descending “doodly doo” noise will follow. So simple, yet so elegant in its execution. I’m not the first person to document the rarity and the desirability of this little guy. One just sold on eBay a couple of weeks ago for $163, and that one had condition issues (although it did work). I’ve seen them sell for as high as $290 in nice shape, so clearly, this is a valuable item with a track record of high sales for what is essentially an electronic attachment for a pencil-shaped object. I think so few were saved because the show is meant for a preschool audience, and so once you are too old for picture pages, why save it? So how are you supposed to stumble upon one outside of something like eBay? I guess you get lucky like I did recently. Very, VERY lucky. I was checking out a neighborhood yard sale in South Jersey. Since I finished up earlier than expected, I decided to drive about 20 minutes to a local flea market. On the way there, I noticed that a mini flea market/community yard sale was being held by the Knights of Columbus. Since it was only a slight detour, I decided to pop on by. My, my, that's quite a lot of Picture Pages videos! These Picture Pages workbooks are worth it just for the Coz's various insane expressions on the covers! I found a few other things, and as the seller was getting ready to bag them, I noticed that they had a pile of the Picture Pages workbooks behind them. They said they would throw those in with the two bucks I already spent. Again, I don’t consider these to be terribly valuable, but it’s nice to have them. So I asked them if they had “the pen” (I didn’t want to look like too much of an obsessive Picture Pages fan), and they said they didn’t think so. Just as I was about to leave to look around at the other tables, the seller said, “Hey, look what I found!” And sure enough, there was Mortimer Ichabod Marker, in fantastic shape, in the original clear plastic sleeve he had been shipped in so many years ago. The battery cover was intact, and when I got home, he worked perfectly. After I got home, I noticed that the VHS tapes, the workbooks, and Mortimer all fit in rather snugly in the seemingly random cardboard box the seller had given me. 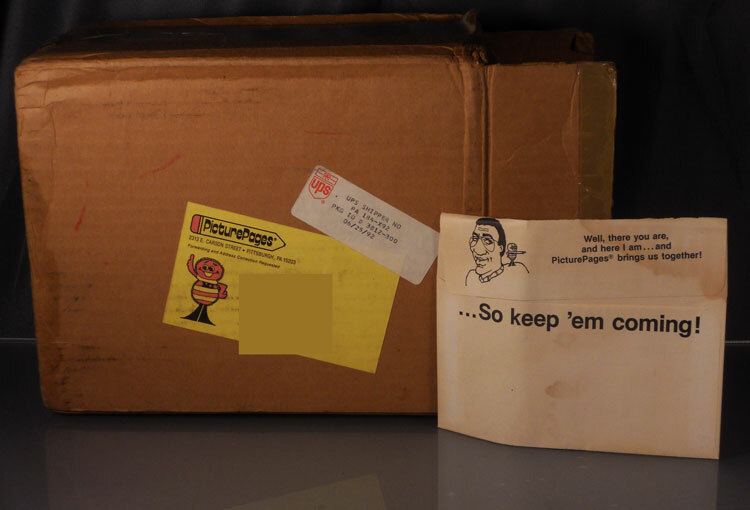 That’s because it turns out it was in the original mail away box, complete with an image of Mortimer Ichabod on the shipping label (ah, the effort companies used to put into packages for kids), and in the bottom of the box was a mail away form with Bill Cosby’s visage on it if you wanted even more Picture Pages tapes. Sadly, the former owner did not ever use it, but instead, they left me with a piece of ephemera that I’m pretty sure is not all that easy to find. One of the most interesting details about this box is that it was shipped in 1992. While Picture Pages was still being shown, I’m a little shocked that the mail-in offer was still valid that late into Picture Pages history. Then again, The Cosby Show was still on, so why not continue to capitalize on the rather fortuitous association? While it’s shocking, I did find advertisements that said the Picture Pages tapes were still available in 1994. In other words, Mortimer Ichabod is clearly not easy to find, but he also seems to have been available for several years, so with enough persistence, patience, or just plain ol’ dumb luck like what I had, you may be fortunate enough to add one to your own collection, and when you do, it will truly be time to let Bill Cosby do a Picture Page with you. This entry was posted in 1980's, Art, Ben, Humor, Toys. Bookmark the permalink. Wow. Did you spend more than $460 to get two Mortimer? I follow them whenever they come up and I know two have come up rather recently. I don’t think anyone’s found an original price tag for these. Keep in mind, the one I have here came as part of a set with the videos. VHS tapes used to be rather expensive, and if you could only order them from magazine ads or television ads, chances are you had to spend something just to get the video sets. Of course, the VHS tapes aren’t worth much and now everyone wants the marker. I have one mine in sealed original box. Great score! I’ve always wondered what the inside of the workbooks look like exactly. Are the lessons / layouts identical to those on the show? Any chance you could email me a few photos of some workbook pages (or maybe post them online)? It would be much appreciated! I just listed a Mortimer Ichabod pen for sale on eBay and wanted to let anyone know who may be looking for one to add to their Picture Pages collection.